What can you say about a circus that hasn’t already been said? That it is fun, inventive, dangerous? Contemporary Swedish troupe Cirkus Cirkor is all of those things and so much more, as this particular group of performers is also collectively in action, extremely amiable, inexplicably charming, and amazingly imaginative, especially given the seeming simplicity of their show’s premise. Inside Out, the company’s current incarnation, juxtaposes the ‘real’ world against the bohemian, but somehow, more earthed realm of the circus, from the perspective of a non-circus person, so it is circus, reflected back as us as seen through the eyes of the audience. In effect, it mirrors us, looking at it, in ways that are often just as surprising as they are unexpectedly enlightening and, enjoyable. As the show begins, the lanky, ghost faced ring-master who had been cheerily greeting visitors takes to his stationary bicycle onstage, ‘riding’ casually at first, then, once it becomes apparent that his pedalling provides electrical power for the show, more vigorously. As no-one, not even a circus person can be in two places at once, help is eventually recruited from the audience in the guise of a trench coat bearing young man in office attire, who replaces him on the bike. As the show goes on, its’ proceedings, seemingly, become shambolic, with its cast of archetypal characters doing their own things simultaneously on various parts of the stage - juggler juggling, acrobats co-balancing, clown clowning, biker pedalling, and so on, while grungy/glam, Swedish rock/pop band Irya’s Playground offers oddly buoyant, off-beatly reflective numbers which somehow, jive perfectly, even with the show’s more flamboyant, intermittently Ingmar Bergman dream-like, surreal scenarios. At first, one feels sorry for the poor fellow on the onstage bike, who doesn’t seem to know what he should be doing next, and we even tend to imagine that we are mutually wondering if he has been duped. However, given the collectively freeing mayhem taking place onstage, by the time he is taken backstage later on, we begin to wonder whether we should be envying him instead. Similarly, a young lady helped on to the stage against her protests by the ring-master at the end of act one looks instantly out of her element and we quickly identify with her worried expression, at the same time being doubly glad we have not been recruited ourselves as an impish bearded lady lies in repose, her body levitating before us. Did I say levitating? I did, and there are there few atypical ‘circus’ aspects, past or present (save the use of ‘real’ animals) missing from Inside Out, for it offers its own unique interpretations of trapeze, juggling, stilt-walking, unicycle riding, whirling inside of a giant hoop and other assorted acrobatics, but there are also very human and commendable aspects to the show which make it both unique and endearing. 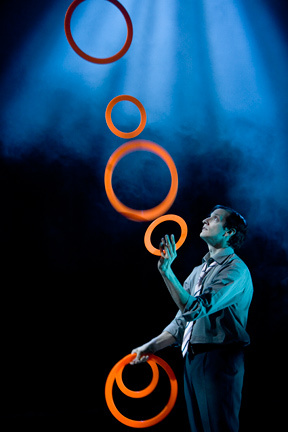 To top it all off, as they say in this world of spangles and illusions, Inside Out boasts some of the most skilled circus practitioners one could ever hope to encounter and with droll but enlivening Irya’s Playground providing musical accompaniment, you’re also, effectively getting two shows in one. There are, nevertheless, still some topping show-stopping moments in Inside Out, among them the unprecedented, awe-inspiring juggling of Jay Gilligan, which, coming from a former child who looked forward to the annual arrival of the ‘Big Top’ to her hometown more than that of Santa Claus, is really saying something. Then, there is the incredibly tight orchestration of the breath-holding trapeze double-act of Sanna Kopra and Mirja Jauhiainen, who together bring down the house in terms of cheers. Not to slight the heart-stopping pole walking/dropping of Anna Lagerkvist, the rubber limbed shenanigans of ring-master, Fefe Deijfen, or the gracefully mounted illusionism of the show’s cryptic nod to sideshows of yore, bearded-lady, Angela Wand. Last but not least, we were among the wowed before aforementioned hoop-master Jens Engman and his similarly agile comrade du circus, balancer Andre Farstad. Then there are the bags, bottles, cages and hearts full of sheer, ‘how’d they do that?’ magic this show contains... Though to say much more about that would be to give too much away! That said, it must be added that the company’s resourcefulness with few or no props at times inspires moments when their thoroughly involving characterisations are at their most convincing, which is also an integral part of Inside Out’s sawdust and tinsel-tinged success. The show’s staging, which is deceptively simplistic and quaint at the outset, progressively unravels into a spectacle in itself with the organically free-flowing projections of Magnus Fyrhake adding a myriad of dimensions to an inexplicably intriguing variety of scenarios and premises dreamt up and directed by Tilde Bijorfors, each with its’ own oft bio/lab inspired costumes designed by talented Set Designer, Sigyn Stenqvist, and the show’s experimental, specifically coordinated avant-garde choreography, stemming from the imagination of Dag Andersson. As one would imagine, these integral individuals were ably assisted by a host of Designers, Technicians, Roadies, Stage Managers etc.,among them Lina B. Frank - ‘Abstract costume/sculptural construction’, Jenny Larrson-Lighting design, Director of magic, Thorsten Andreassen and many others too numerous to mention here. Given its wildly enthusiastic, highly talented performers, spirited musical accompaniment and transformative and engaging enactment, the show’s hard won standing ovations were well deserved. For, by the time the company was enjoying their many curtain calls, Inside Out had evolved into a real ‘don’t try this at home’, hugely lovable, big-hearted, absolutely unmissable show.